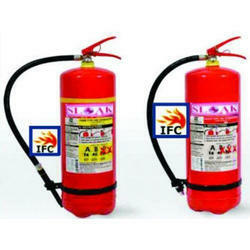 It is liquid chemical type fire extinguisher. Mechanical Foam type FIre Extinguisher is designed to extinguish A & B class of fire involving Wood, Paper, Cloth, Textile, Stationery & Very Special Blanket effect on Flammable & Volatile liquids. Mechenical Foam Type Fire Extinguisher (Store Pressure & Cartridge Type) Mechenical Foam Type Fire Extinguisher Suitable for 'A' & 'B' Class of Fire involving material like wood, paper, Textiles, oil, Petroleum products, Grease. 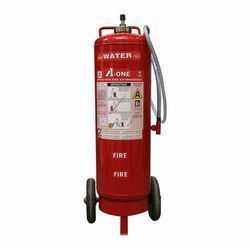 Mechanical Foam Type Fire Extinguishers are useful for fire involving materials like oil, petroleum products, solvents, grease, paint, etc. It extinguishes fire by blanketing and cooling down the container and the contents. This extinguisher forms a thick layer of foam over the burning surface, effectively cutting of atmospheric supply of oxygen to the burning surface thereby smothering the fire and preventing re-ignition. Foam extinguishes.